Normally I start a review with all of the unboxing and physical qualities of the Bible I’m reviewing. This is going to be an exception. I am not a Koine Greek expert or scholar. I just know the Greek alphabet and some very basic basics so don’t expect any sage wisdom or keen insights into the Greek from me on this review. That being said, the reason I am listing all of the info from Hendrickson’s site is that there are many Greek New Testaments out there and I want to make sure that if you are looking to purchase one that you don’t accidently get one you aren’t after. After the information from the American Publisher I will do my usual review process. 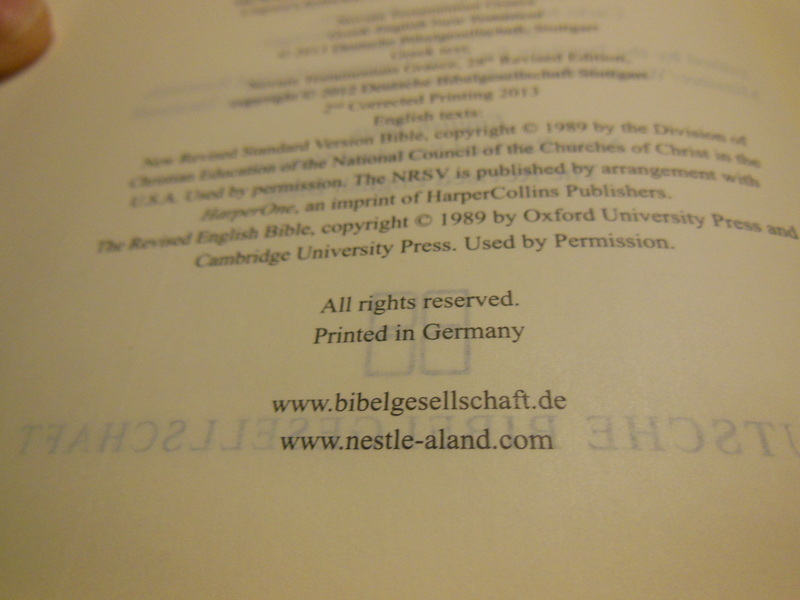 This is the twenty-eighth edition of the Nestle-Aland Novum Testamentum Graece (NA28). 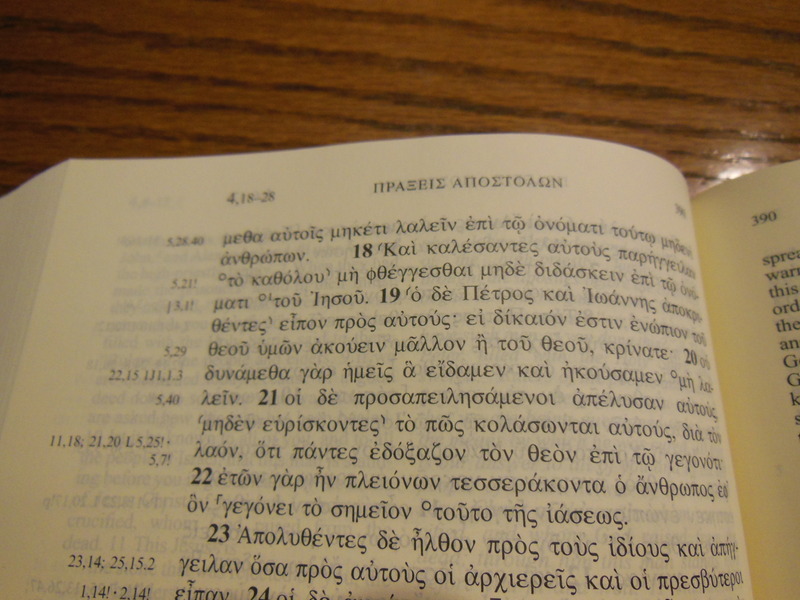 NA28 is the standard scholarly edition of the Greek New Testament used by scholars, Bible translators, professors, students, and pastors worldwide. Now NA28 has been revised and improved: • Critical apparatus revised and easier to use • Papyrii 117-127 included for the first time • In-depth revision of the Catholic Epistles, with more than 30 changes to the upper text • Scripture references systematically reviewed for accuracy • The NA28 with NRSV/REB Greek-English New Testament includes the 28th edition of the Nestle Aland Novum Testamentum Graece, the New Revised Standard Version, and the Revised English Bible. The New Testament arrived in a cardboard box from Hendrickson. 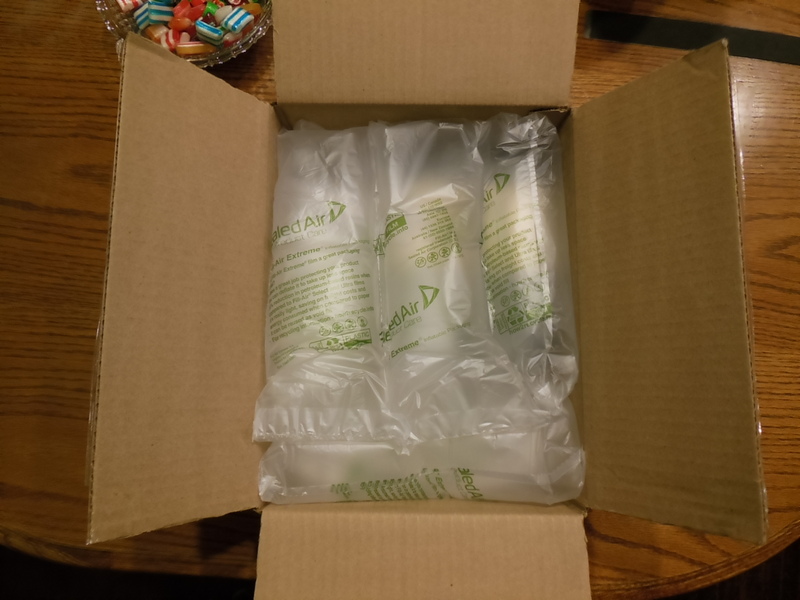 It had airbag cushions and arrived undamaged. 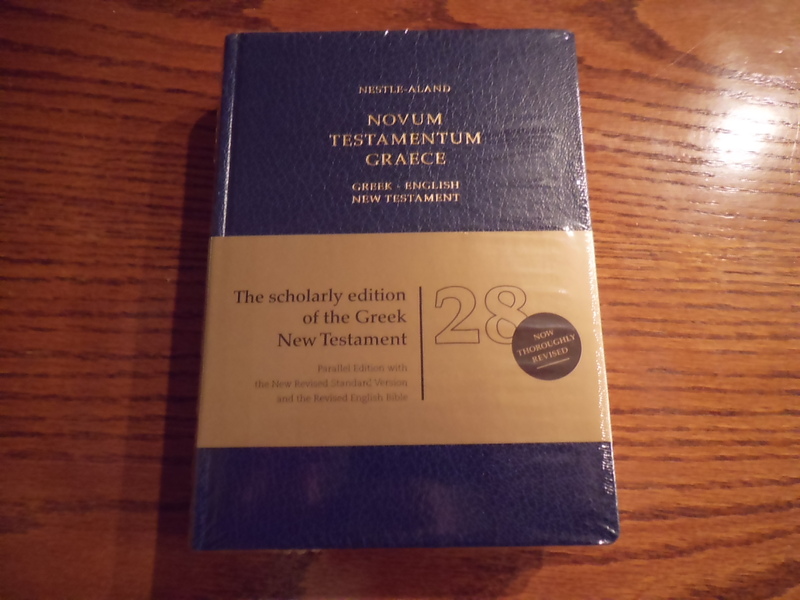 Upon opening the box I was presented with the New Testament wrapped in plastic shrink wrap. 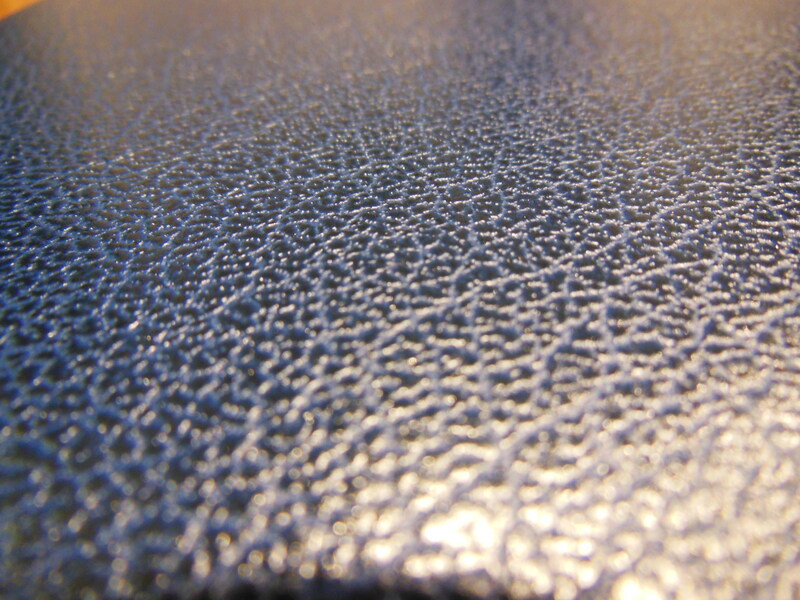 The cover is a blue textured hardcover, but it is very thin book board. It is almost exactly the same size as my Cambridge Clarion Bible. There are some notes on the translation in the front. 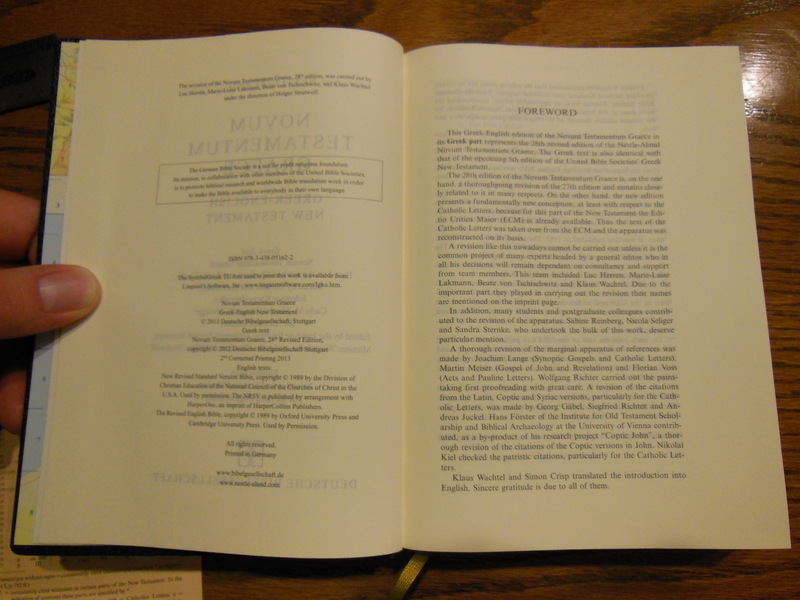 This New Testament is printed and bound in Germany. 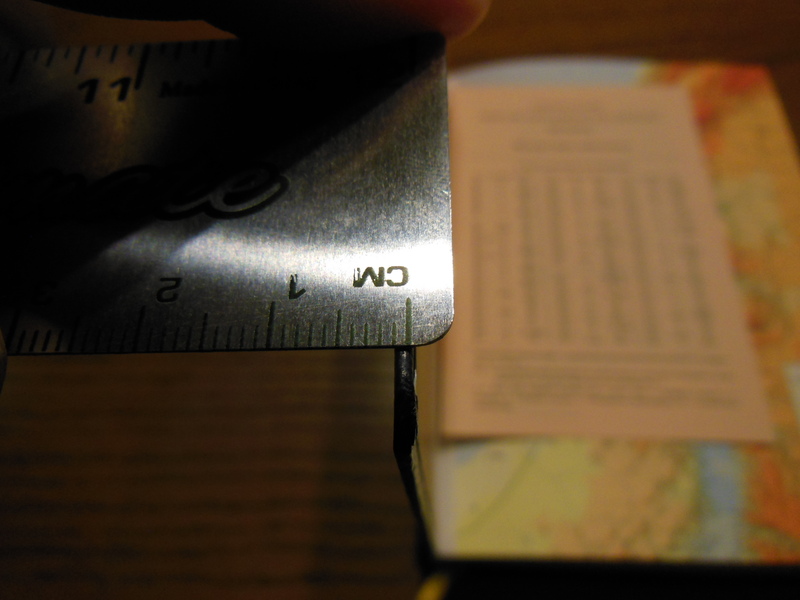 It is a very nice sewn binding. I was a little doubtful of the book being worth $99.00 when I saw the cover, but once I opened it and saw the quality of the print and sewn binding along with the Greek, NSRV, and REB I thought better of it. I am not a fan of the NSRV. I would never buy that version as a standalone Bible. I believe that their gender inclusive directives for translating are not true to the overall context of the word of God. I am not very familiar with the REB. I was surprised that they were able to cram in the Greek and two English translations without making this New Testament bigger than it is. Of course being just a New Testament is the key to the size of this book. When you look at the inside covers of this New Testament you are seeing the only maps it has. If you purchased this I am certain you didn’t do so for maps though. You probably want to do some Greek studies. For that purpose I don’t think you’ll be disappointed. I am not sure what size the font is. It isn’t specified in any of the information I’ve seen. It appears to be approximately 8 point font. I’ll have to e-mail Hendrickson and ask them. When I find out I will post the information as an update. The print is sharp and clear contrasting well against this cream colored paper. The paper is opaque and smooth. It feels like a high quality Bible paper. I already mentioned that on one page you’ll have the Greek and then on the other you’ll have the NRSV and the REB. The NRSV is in plain type and the REB is in italics. There is one gold color ribbon marker that. It appears to be purposely frayed on the end. The binding is very well done. It is sewn and flexible. I opened it right up and it didn’t need any breaking in. It opens past flat when you hold it in one hand. 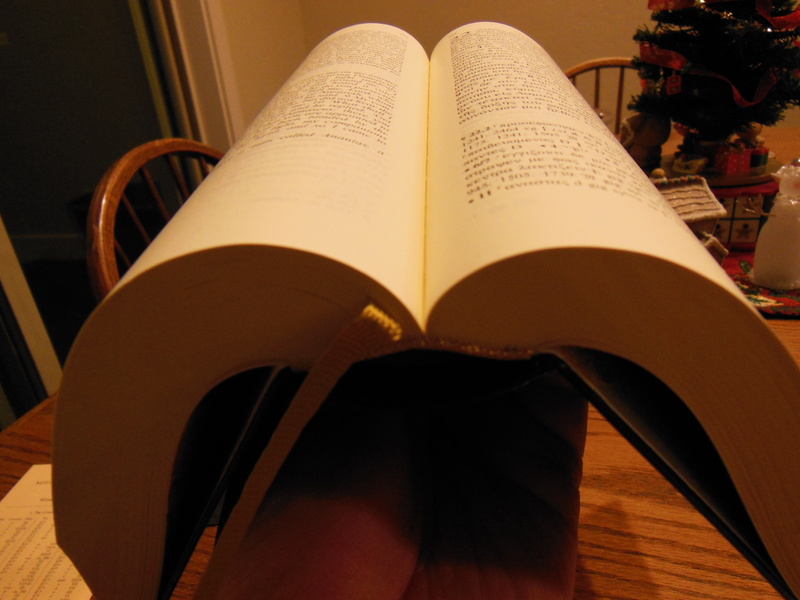 I found it to be just the right size for reading or studying. In the back you’ll find the appendices. 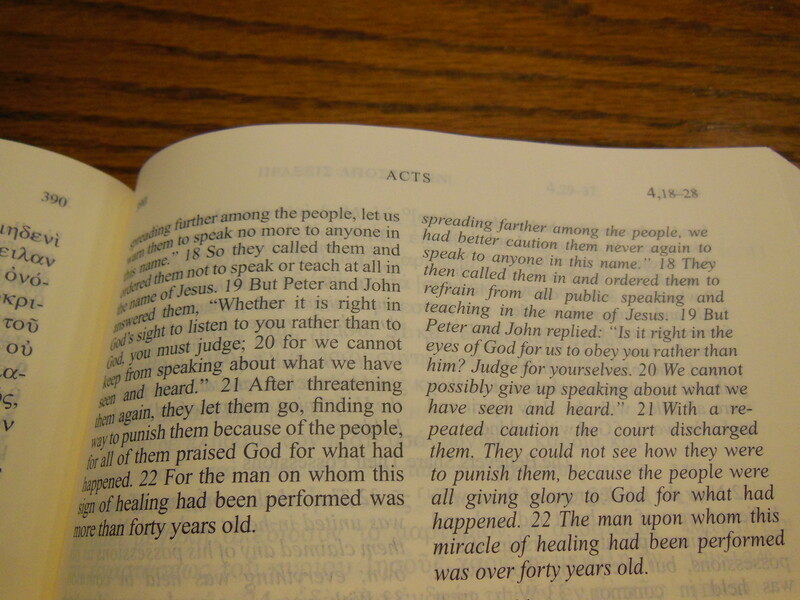 The only thing I’d like to see is this type of New Testament with the NASB instead of the NRSV. So there you have it, my review of a neat little Greek New Testament with two English translations in parallel. 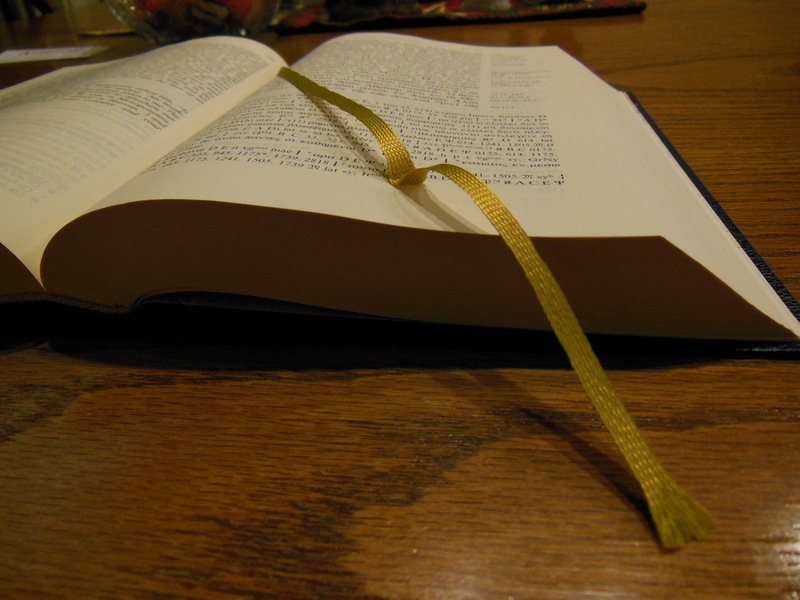 Need a Large Print Personal Size Reference Bible? Holman Has a Great Value for You.